1. an opening or aperture. 2. the oral cavity, which forms the beginning of the digestive system and in which the chewing of food takes place. The mouth is also the site of the organs of taste and of the teeth, tongue, and lips. It is not only the entrance to the body for food and sometimes air, but also a major organ of speech and emotional expression. Structure. Except for the teeth, the interior of the mouth is covered with mucous membrane. This thin lining extends out from the front of the mouth to form the lips. Salivary glands lie above and below the mouth and produce saliva, a liquid that protects the delicate membranes and mixes with food in the first step of digestion of food. The palate forms the roof of the mouth. The front two thirds of the palate comprises the hard palate, and the back third, the soft palate. The soft palate is hinged to the hard palate and is flanked on both sides by the tonsils. 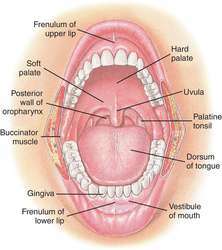 In the middle of the soft palate is the uvula, a projection pointing down to the tongue. At the root of the tongue, below the uvula, lies the epiglottis. Disorders. Because of its special functions the mouth is constantly exposed to infection and irritation. These can affect the whole mouth generally or only certain parts, such as the tongue. Inflammation of the mouth, or stomatitis, can indicate the presence of either a mild or severe disease. Local conditions include thrush, gingivitis, and herpes simplex. Generalized diseases can also give rise to inflammation of the mouth; these include diphtheria, tuberculosis, blood dyscrasias, vitamin deficiencies, and syphilis. Cancer can afflict the sides of the mouth, the lips, the tongue, and occasionally the salivary glands. Continued irritation, such as pipe smoking, is thought to be a cause of many mouth cancers. Any persistent sore or swelling should be promptly examined by a health care worker. Birth defects affecting the mouth include cleft lip and cleft palate. Both have the same cause: failure of adjacent parts of the body to unite properly in fetal life. A cleft lip (popularly called “harelip”) involves a split in the upper lip. Sometimes the cleft extends into the upper jaw, the floor of the nose, and the palate. The resulting deformity of nose and mouth interferes with sucking and speech unless corrected by surgery. A cleft palate, which may cause difficulties in speaking and eating, signifies a cleavage in the uvula and the soft palate. Both conditions can be successfully corrected by surgery. mouth care techniques of oral hygiene whose purpose is to preserve or restore and maintain normal physiology and function of the oral cavity. These include assessment of the mouth, cleaning, and removal of debris from the teeth, palate, tongue, and sides of the mouth. Periodically and systematically cleaning the mouth, brushing the teeth, and flossing help prevent dental caries, inflammatory periodontal disease, and halitosis. Mouth care also promotes a sense of cleanliness and well-being, facilitates speech, and helps overcome loss of appetite. Additionally, a healthy oral mucosa is the first line of defense against infection in the oral cavity. In the normal mouth a healthy oral mucosa is maintained in part by movements of the tongue, lips, and cheeks during speech, chewing, and swallowing. Salivation and the mechanical action of chewing foods also help keep the mucosa soft and moist. Brushing and flossing or other less forceful measures facilitate removal of debris, bacteria, and plaque and preserve the integrity of the teeth and gums. Patients most in need of special mouth care include those who (1) breathe through their mouths because of nasal obstruction or other conditions, (2) are receiving nasal oxygen, (3) have a restricted oral intake or are being fed by tube, (4) are comatose or otherwise unable to care for their teeth and mouth, (5) are receiving radiation therapy to the head and neck, or (6) are receiving chemotherapy for a malignancy. Both radiation and chemotherapy can cause severe stomatitis and xerostomia. Initial and ongoing assessment of the oral cavity can establish the type and frequency of mouth care needed. In general, the more easily damaged the integrity of the oral mucosa, the more gentle the chemical and mechanical cleansing. If brushing with a soft nylon toothbrush and nonabrasive toothpaste and flossing cannot be tolerated, the teeth can be cleaned with unflavored oral care sponges dipped into plain water or a physiologic saline solution. Flossing is contraindicated if the patient has a low platelet count or low white cell count. Mouthwashes are not a substitute for toothbrushing. Xerostomia (excessive dryness of the mouth) can be relieved by artificial saliva or by application of a water soluble lubricant such as KY jelly. If the patient is able to eat and drink, fluids and moist foods are encouraged. Dry, cracked lips respond best to petroleum jelly or a camphor-based lip balm. Lemon juice and glycerin are not recommended in patients with mucositis because when used over a period of time glycerin tends to dry oral tissues. Thick and tenacious mucus in the oral cavity can be removed by diluted hydrogen peroxide or socium bicarbonate solution. The hydrogen peroxide solution is prepared by mixing equal parts hydrogen peroxide (USP 3 per cent) and water just before application. A peroxide solution is contraindicated if the patient has leukemia or there are freshly granulating surfaces or exposed bone in the oral cavity. Sodium bicarbonate solution is made by adding one teaspoon of sodium bicarbonate to one pint (half a liter) of water. The same proportions of salt and water are used to prepare a 0.9 per cent solution of normal saline. If pain in the mouth prevents a patient from eating comfortably, it may be possible to provide temporary relief by rinsing the mouth with a solution of one part lidocaine viscous 2 per cent added to two parts water. However, since this solution diminishes sensitivity to heat, the patient must not be fed hot food or drinks that could cause burns. Diligent, systematic mouth care is an integral part of hospital care. Research has shown that such care prevents many problems of nutrition, infection, and pain associated with stomatitis, especially those occurring as a complication of chemotherapy and radiation therapy. Moreover, routine care of the mouth, teeth, and gums, no matter what the health status of the patient, can prevent many problems, maintain a healthy oral cavity, and do much to make the patient more comfortable. denture sore mouth denture stomatitis. trench mouth name given to necrotizing ulcerative gingivitis during World War I, when it was common among soldiers in the trenches. 2. The opening, usually the external opening, of a cavity or canal. 2. the anterior opening of the alimentary canal, the cavity containing the tongue and teeth. trench mouth necrotizing ulcerative gingivitis. To take in or touch with the mouth: Small children tend to mouth their toys. 1 the nearly oval oral cavity at the superior, anterior end of the digestive tube, bounded anteriorly by the lips and containing the tongue and the teeth. It consists of the vestibule and the oral cavity proper. The vestibule, situated in front of the teeth, is bounded externally by the lips and the cheeks, internally by the gums and the teeth. The vestibule receives the secretion from the parotid salivary glands. The oral cavity proper is bounded by the alveolar arches and the teeth, communicates with the pharynx, and is roofed by the hard and the soft palates. The tongue forms the greater part of the floor of the cavity. The rest of the floor is formed by the reflection of the mucous membrane from the sides and the bottom of the tongue to the gum lining the inner part of the mandible. The oral cavity proper receives the secretion from the submandibular and sublingual salivary glands. 1. The opening of any cavity. Tongue: dry, coated, smooth, strawberry, large, pigmented, geographic, deviated, tremulous, sore. Gums and teeth: gingivitis, sordes, lead line, pyorrhea, atrophy, hypertrophy, dental caries, alveolar abscesses. Mucous membranes and other parts of mouth: eruptions accompanying exanthematous diseases, stomatitis, canker sores, herpes simplex, thrush, trench mouth, cysts, tumors, carcinoma, lesions of syphilis such as chancre, mucous patches, gumma, lesions of tuberculosis, abscesses. Disorders of the mouth cavity may be indications of purely local diseases or they may be symptoms of systemic disturbances such as dehydration, pernicious anemia, and nutritional deficiencies, esp. avitaminosis. Rashes of the mouth may indicate stomatitis, measles, or scarlet fever. Rashes on lips may indicate typhoid fever, meningitis, or pneumonia. In secondary syphilis, chancre, cancer, and epithelioma, mucous patches appear. In addition to visual examination, careful digital examination should be made because it reveals areas of tenderness and alterations of texture characteristic of leukoplakia, cancer, cystic swellings, and lymphadenopathy. the anterior opening of the ALIMENTARY CANAL of animals through which food is taken into the body. It is often surrounded by mouthparts or tentacles that facilitate feeding. see DIGESTIVE SYSTEM. 2. Opening, usually external, of a cavity or canal. Candida albicans with subsequent monilial infection. n area within the oral cavity located beneath the ventral surface of the tongue. n See gingivitis, necrotizing ulcerative. an opening, especially the oral cavity, which forms the beginning of the digestive system and in which the chewing of food takes place. It is also the site of the organs of taste and the teeth, tongue and lips, and the entrance to the body for food and sometimes air. In animals it is a part of the system of defense and attack. Called also oral cavity, buccal cavity. See also oral. fish that breed in isolated pairs and the spawn of which are incubated in the mouth of the male. Called also Tilapia macrocephala. in food animals may occur in those eating bracken. It is usually a squamous cell carcinoma of gum epithelium. characteristic of dehydration, atropine poisoning. a mature animal with all teeth erupted and in wear. see stomatitis, gingivitis, glossitis, etc. includes stomatitis, necrobacillosis, ulcer, foreign body lodgment, laceration. necrosis, ulceration caused usually by Fusobacterium necrophorum. a name for feline calicivirus or herpesvirus infection because of the infrequent occurrence of ulcerations on the skin, usually of the front paws, as well as the usual location in the mouth; probably the result of transmission from grooming. malocclusion producing marked pointing of the enamel. Seen particularly in horses. avoidance of handling around the mouth may be a sign of dental disease in animals. a device for preventing the mouth from being closed which permits the passage of the hand or an easily damaged piece of equipment such as a rubber stomach tube. See also frick, mcpherson, schoupe, drinkwater, bayer specula. There are several unnamed pieces: a wooden one used in cows, which is inserted crossways between the teeth and a stomach tube passed through a hole in its middle; a metal one used in horses by placing its two dental plates over the tables of the incisor teeth and screwing them apart with a thumbscrew working inside the frame that supports the plates; and a similar, simpler device used in sheep and small pigs which has two horizontal bars running crossways between the two parallel prongs of a handheld, fork-like device. It is inserted horizontally between the molar teeth and then turned to a vertical position. in large animals, ulcers of the oral mucosa usually caused by secondary bacterial infection of less severe mucosal lesions caused by a primary disease, e.g. mucosal disease. In cats, ulcerations are often associated with feline viral respiratory disease complex. a common location for infection by papilloma virus. a twisted mouth caused by unilateral malocclusion. Q. What is Mouth cancer? My grandfather has been diagnosed with mouth cancer. What is it? Is it dangerous? A. Cancer of the mouth is dangerous as are all cancers. The earlier this cancer is detected, the better the survival rates are. If the cancer is caught in the first stage the survival rates can go up to 90% of patients surviving five years and most of these will be cured. Q. What are the symptoms of mouth cancer? I have an ulcer in my mouth that won't go away, could it be cancer? A. Have you had this ulcer for a long time? over 3 weeks? If so, consult your GP however don't be alarmed as it isn't necessarily cancer, though it's always better to check it out and not neglect it.